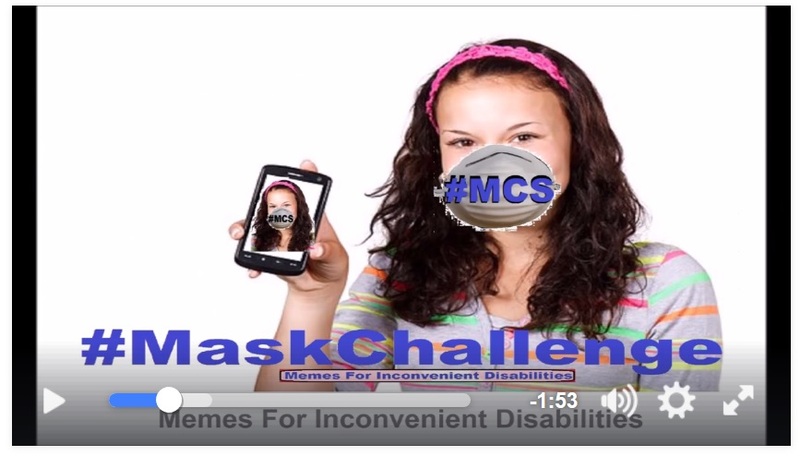 MCS Mask Challenge for Family, Friends, and You! Here’s an easy way for everyone to show some support! And maybe, just maybe, wearing a mask for an hour or a day will spread some understanding of why the people who fought for smoke free policies did that instead of expecting all non-smokers to just wear masks always and everywhere. #MaskChallenge! Do it! Grow #MCSAwareness! or worse, an oversimplified diagnosis of any one of the many symptoms. Or take it a bit farther… wear a mask in solidarity for a whole day! * Notice how challenging it is to brush your teeth or eat a sammich. * Notice how people stare and flinch away from you. * Notice how it impacts your work performance, especially if you deal with the public, or coworkers. * Notice how itchy and sweaty your face gets. 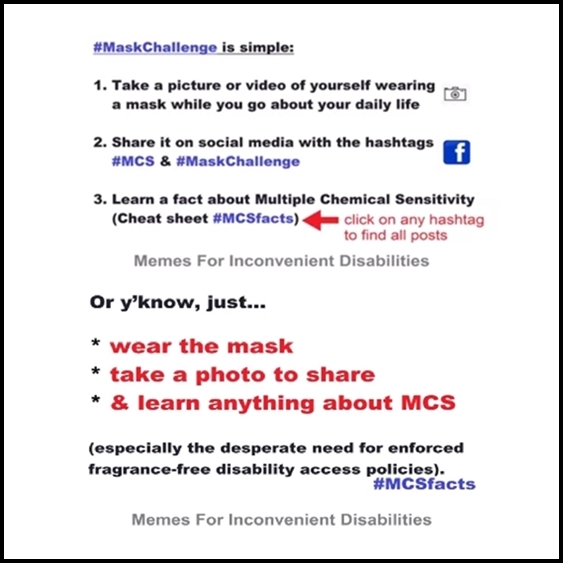 * Notice how many people have never heard of MCS, and how skeptical they are (if they even bother to ask why you’re wearing the mask – mostly it’s just gonna be stares and flinching though). Share those observations with your picture or video. on your porch and hold your breath any time you need to run inside to pee! (because this is where many people w MCS end up when homelessness occurs due to inaccessible housing, illness and poverty colliding in the worst possible ways). And don’t forget you have to find a new place to hide out every time you can smell a dryer vent emitting those poisonous laundry fumes! – & learn anything about MCS (especially the desperate need for enforced fragrance-free #disabilityaccess policies). You can change all your personal care, laundry, and cleaning products to ones that are fragrance-free and non-toxic, and then show us before and after pictures of all the products and why a mask is no longer needed! This entry was posted in Accessibility, Action, Air Quality, Environmental Health, Fragrance, Pollution, Public Health and tagged activism, awareness, chemical sensitivity, environmental sensitivities, IAQ, invisible disabilities, masks, MCS, multiple chemical sensitivities, petrochemicals, support, toxic trespass, video. Bookmark the permalink. Thank you for writing these. Can we add a few more? Due to EMFs and telephone sound distortions, limit phone calls to landlines only, and personal calls limited to one or two minutes. When talking to business, offices, etc., ask the person to speak very, very slowly and clearly, and to be as succinct as possible. No television, radio, or, DVDs/videocassettes, or internet, or even reading stored things on a computer. Only listen to music or talks on CD, cassette, or LPs. And listen only to one or two songs per day, or every other day. When endeavoring to find what you can wear, eat, use, etc., buy three or four or more, of something, different brands. Keep one, return one or two. Keep trying to use them. Realize you can only use one all those, if you are fortunate. It is now too late to return the others. Perhaps sometime/someday, someone will come along to whom you can give the rest. If not, throw out all but one of what you so painstakingly researched, found, and bought. I could up this a few more levels with how shopping is, and what is required to recover. However, this shows more facets to what those with severe MCS/CI (Chemical Injury) live with, day in and day out, year after year. Thanks you very much for your website, and all your care for those who have been injured by the poisons polluting our everyday worlds.